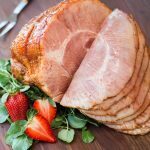 This holiday glazed ham recipe has been sponsored in partnership with California Giant Berry Farms. As always, all opinions expressed are my own. Easter dinner (or brunch, depending on the year) always means one of two dishes for my family: roasted leg of lamb or glazed ham. Both are crowdpleasers, but when it comes to effortless, yet elegant entertaining for a large group, few dishes fit the bill more than spiral-sliced ham. Since this type of ham is pre-cooked, all you need to do is heat it through in the oven and caramelize the exterior with your favorite glaze. 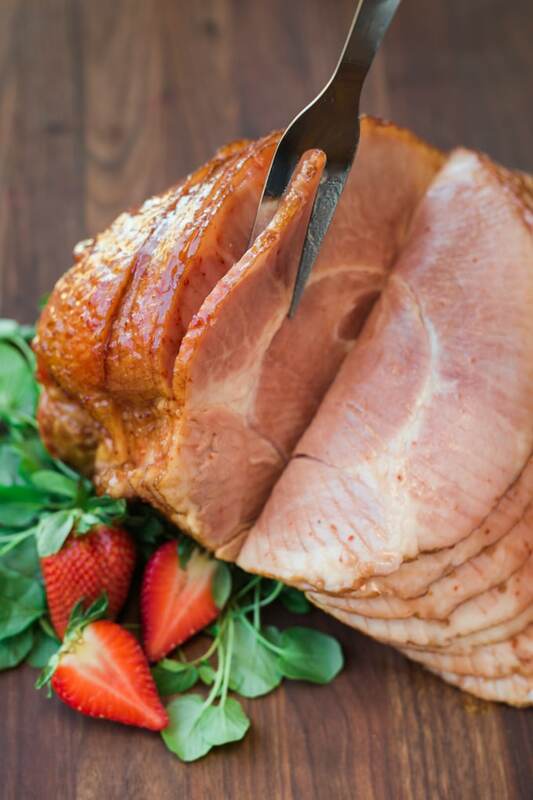 Like many, I love pairing sweet fruit with the smoky, salty flavor of ham. With spring heralding the start of prime strawberry season, it’s the perfect time to dress up your Easter ham with a fresh strawberry sauce. For my Strawberry-Chipotle Glazed Ham, I simmer strawberry puree with brown sugar, honey, and a touch of chipotle in adobo until thick and glossy, and brush it onto the ham for the last 30 minutes of baking. It’s some of the best flavors of spring, with a hint of heat in the background to balance the sweetness. With this recipe post, I’m excited to share that I’m one of California Giant Berry Farms’ Brand Ambassadors for 2017! Prior to our partnership, I’d purchased California Giant’s beautiful berries a number of times in my local markets, and have always loved both their favor and the “wow” factor of their stature. One look at them and you know that these are not your average berries! California Giant prides itself on growing natural, beautiful fruit without GMO’s or chemical enhancers. Grown in sunny California, the berries’ size, vibrant color, and flavor are owed entirely to Mother Nature. Plus, California Giant is a family-founded and owned company, run with family-oriented values. They have a strong philanthropic focus, supporting a number of community initiatives through The California Giant Foundation. Over the past few years, their “Tour de Fresh” cycling program alone has raised close to $500,000 to bring salad bars to school districts across the country. I can’t think of a better company for Striped Spatula to partner with! In terms of preparation, the fresh strawberry glaze is a cinch to make while the ham is warming through in the oven. You’re basically going to make a variation of a strawberry jam on the stove, not quite as thick, and without pectin. All you need is 30 minutes, a food processor or blender, a pot, and a strainer. If you, like me, are a spicy foods lightweight, don’t be scared off by the chipotle! Bear in mind that the sauce will taste spicier straight out of the pot than it will brushed onto the ham. The glazing process and the flavor of the meat itself tones down the heat on the palate. The glaze is also really easy to customize. Half of a chipotle pepper in adobo will bring a very mild warmth to the background of the sauce, which is great if you’re serving guests with a range of heat sensitivities. The pepper can be omitted for an entirely sweet glaze, or increased if you and your family and friends like your ham hot-hot-hot! This spiral strawberry-glazed ham recipe is a showstopper for any holiday celebration. Puree cleaned and trimmed strawberries and chipotle pepper in a blender or food processor until smooth. 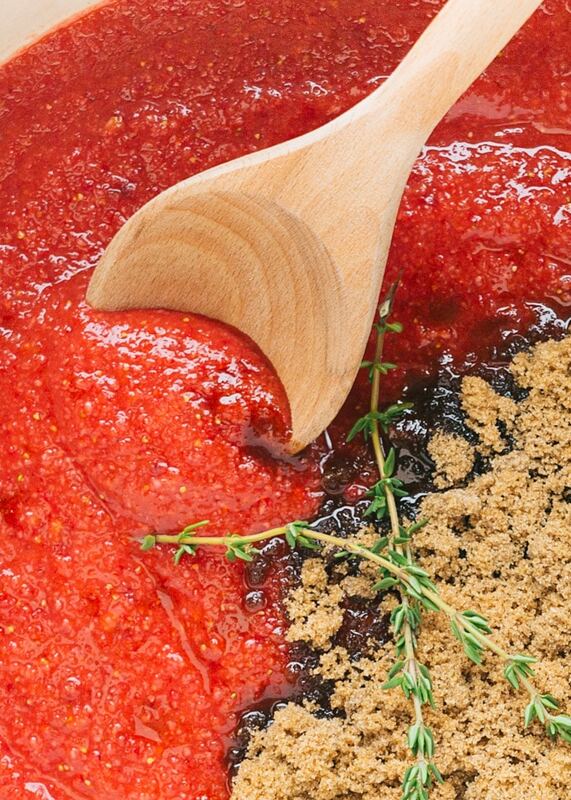 Pour puree into a large pot and stir in brown sugar, honey, water, and thyme sprigs. Bring to a boil over high heat. Reduce heat and simmer, stirring frequently, until glossy and thickened slightly, about 15-20 minutes. Strain mixture through a fine mesh sieve, pressing on solids to extract liquids and strawberry pulp from seeds. Discard solids. You should have about 2 cups of strained glaze. Preheat oven to 275 degrees F. Remove all packaging material and wrap ham tightly in foil. Place into a roasting pan, face-side down. Bake 12-15 minutes per pound to heat through to 140 degrees F.
When 30 minutes baking time remain, unwrap ham and brush glaze all over the outside and between the slices. Bake uncovered for 15 minutes. Glaze ham again and bake for the final 15 minutes, until caramelized and glossy. Let stand 5-10 minutes before serving. If desired, re-warm remaining glaze and serve alongside ham. Fun opportunity alert: California Giant Berry Farms is running a sweepstakes! 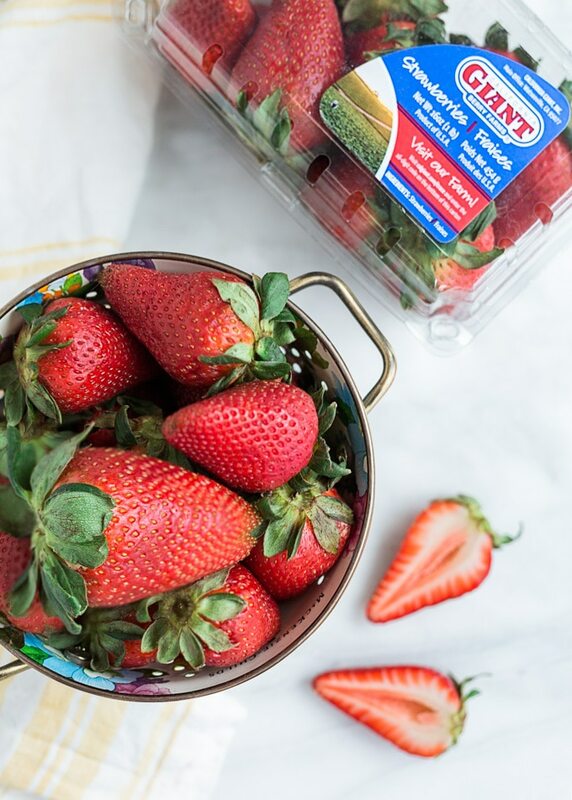 When you buy a package of California Giant’s strawberries, follow this link or click the graphic below to enter your package’s trace code and learn more about the farm where the berries were grown. Every month until September 2017, one entrant will win $100! These photos are gorgeous!!! And I love the idea of a fruity and spicy glaze over a salty ham! (Actually, I bet that combination would be amazing on fish too– I’m filing it away in my brain.) And I’ll look for Giant’s strawberries- I love getting fruit that I know has been treated well! Wow! What a great idea! I never would have thought to glaze ham with strawberry puree, but I am TOTALLY doing this for Easter! Those berries look utterly perfect!! Spicy sweet is the way to go! This ham sounds like perfection, and would be that star of any table! Those berries are beautiful and I will have to see if I can get them where I live! What a lovely main course!